Delta Toilet seats with NightLight provide a gentle, guiding light through the night with a soft blue LED night light set on an automatic nine-hours-on /15-hours-off timer which begins when the batteries are inserted. 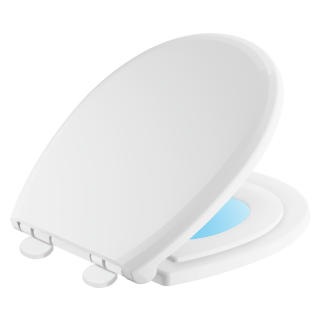 On Delta Potty-Training Toilet Seats with NightLight, a child-size ring lifts out of the way, making it comfortable for the whole family while reducing bathroom clutter. When your toddlers are successfully trained, simply lift and remove the child seat and continue to enjoy the benefits of the night light. How does the toilet seat quick-release function work? How do I turn on the toilet NightLight? Of course! Once the batteries are inserted, the 9-hour timer begins. The NightLight seat will automatically stay on for 9-hours and off for 15 hours. Roughly 6 months depending on the type of battery used. For best results, only use new batteries. 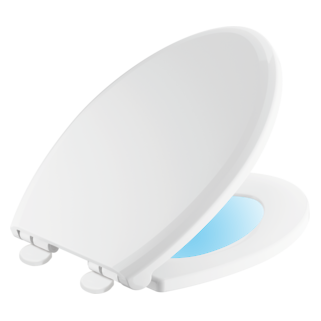 LED light illuminates when toilet seat ring is up or down.